This Thanksgiving Grammar Pack Freebie contains 8 pages of No Prep, Low Ink activities! 3 x poster pages (blank)- for students to use as "anchor charts" and write examples of each term. 2 x word cards- to be cut up and glued into the right spaces on the 'Sort it Out' worksheet. All the worksheets are ready to just print and go! No preparation required! They're all in ink-saving black and white too! 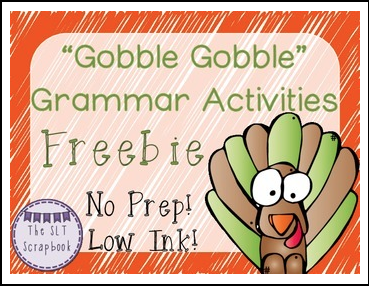 We hope you like this Thanksgiving themed grammar pack freebie! Please leave feedback, it is very much appreciated!